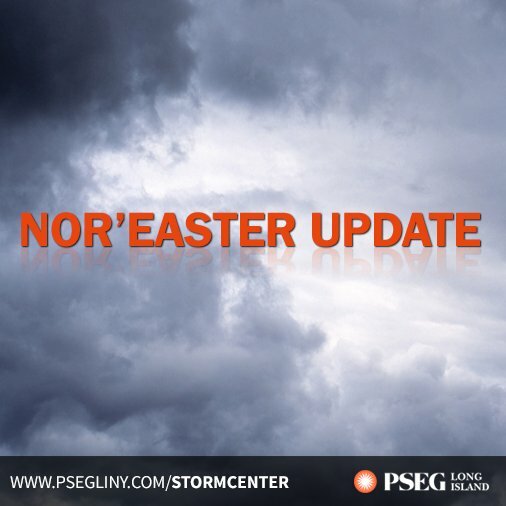 At this time, PSEG Long Island is reporting 2,261 customers without power due to the strong winds and heavy rain affecting the service territory. Long Island, NY - January 24, 2017 - At this time, PSEG Long Island is reporting 2,261 customers without power due to the strong winds and heavy rain affecting the service territory. As of only 146 customers that lost power were still out. Since the storm began Monday morning, the utility has restored service to more than 26,000 customers. Crews will continue to work throughout the day to restore service to customers without power. Customers can visit PSEG Long Island’s mobile friendly outage map at at any time to check on the status of their outage. Customers should understand that restoration times reflect an estimate of when a customer's power could be restored. However, as crews assess specific areas, these times may be improved and service may be restored before the given estimate. PSEG Long Island continues to ask customers to be patient as crews work to restore service across the territory. To report downed wires or power outages, call PSEG Long Island’s Electric Service line at 1-800-490-0075. Also, customers can report outages by logging into their PSEG Long Island account online or by texting “OUT” to PSEGLI (773454). The utility’s mobile-friendly website includes an “Outage Map” that is updated every 15 minutes and displays the location and status of power outages in PSEG Long Island’s service area. Subject: LongIsland.com - Your Name sent you Article details of "PSEG Long Island: Storm Update - January 24, 2017 10:00 a.m. ET"